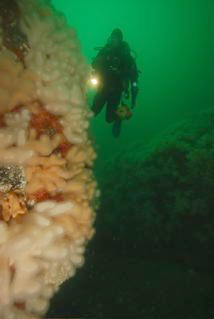 Conditions came together this weekend to dive one of the Farne islands most spectacular dives, Whirl Rocks. Situated some 200 metres east of the Knivestone reef, Whirl Rocks consists of a series of underwater pinnacles that rise up from 30 metres to within a few metres of the surface. This combination of fierce currents and wave surge however ensures that the steep rocky faces of the submarine cliffs and gulleys are covered in a luxurious coating of colourful marine growth. Shoals of pelagic fish along with solitary large Pollack patrol the current waiting for an easy feed. 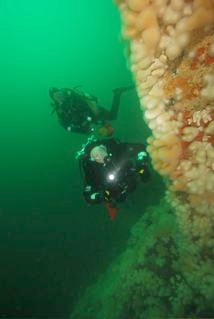 Whirl rocks however offer more than just a spectacular scenic dive as its position on the outer edge of the Farnes has inevitably resulted in vessels being lost against the reef. The aim of this day’s particular dive was to find and dive the remains of one of these lost ships, the SS Jan van Ryswck. This Belgian steamship was constructed and launched in Stockton in 1907 but was lost on the 21/05/1927 whilst on passage from Antwerp to Grangemouth with a general cargo that included pig iron and steel ingots. Today the remains of a wreck, which is believed to the Jan Van Ryswck lies at the base of the Southern edge of the cliffs at the Whirl Rocks site. The remains of her bow can be found in a gulley, with the remains of her two boilers and a particularly impressive remains of her steam engine and spare propeller laying close to the base of the cliff face that towers up towards the surface. 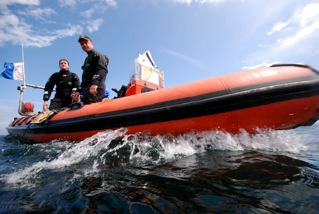 Whilst the wreck has been broken apart a combination of rough seas and strong tidal currents, there is more than enough wreckage to interest even the most avid of wreck dives. This site also has the advantage of offering the most scenic of safety stops, as one surveys the colourful marine life that clings to the reef even in the more exposed shallow waters to be found close to the surface. Once everyone was safely back on board it was time to head back to Seahouses and pick up Bill and Cally before returning back out to the Farnes for a second dive. With the current now starting to flood south we opted to dive close to the Crumstone reef. 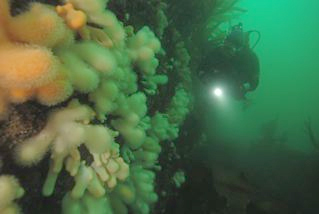 Close to this rocky reef can be found the remains of a small long lost vessel, almost certainly a steam trawler. 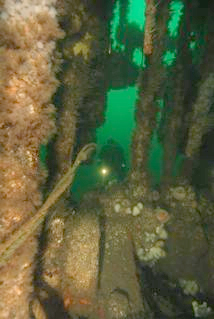 Here in 6 metres of water can be found the remains of the ships boiler, whilst close half hidden under the kelp can be found the remains of her steam engine. Drifting with the tide we sort shelter in a large underwater amphitheatre where the light golden sand reflected the light upwards, highlighting a life and death struggle as shoals of sand eels were ruthlessly preyed upon by swarms of pelagic fish. Some of the party drifted on until they reached the dramatic and very scenic cliffs known as the fang. Andy and Nicola chose to swim north along the Callers until eventually they reached the start of the wreckage site at the top of this area of the reef which marks the start where the steamship Britannia ran aground and was lost on the 25 th September 1915. Having noted the marks for this site it was time to recover the last two divers prior to heading back to Seahouses. Yet again the Farnes had provided two spectacular dives in one day.